Clint: You’re in good shape? Sally: I can’t tell you how brilliant I am. I mean, I’m not cured or anything, but I have no pain anymore. I mean, I had 17 years of pain, and I got to the stage where I was like, “Uh, can’t stand this any longer.” The only thing I thought, “Well, that will never work, but I’ll try it.” You know? I was the last person to think that diet would work, you know? I mean, I’m not a sort of green…I have a gardener who’s a vegan, so he’s always telling me to eat better. But I’ve been great since I started. I haven’t taken a solitary painkiller. I haven’t taken a solitary painkiller since I started in mid-May. Nothing. Sally: Doctor can’t believe it. I mean, my CRP is .05. Clint: Right, yeah. It’s unbelievable. Clint: That’s excellent, so you’re educating your…is it the nurse who saw you last couple of times? Sally: No, it was my rheumatologist up in Dublin. Clint: Yeah, exactly, exactly, that’s right, that’s right. Sally: So I thought I’m gonna go to the top, I’m gonna look at the top rheumatologist in Dublin, and go to Dublin. And she’s brilliant. And she’s younger than me and she’s got kids and, you know, she’s great. Clint: Fantastic. All right, why don’t we just keep rolling as we are? How did it all begin? What happened? You said you’ve had it for a very long time, how did it first start? And I went, “Oh, that’s brilliant.” I was so pleased to have something I could put a name to and look up and Google and… I probably didn’t Google much in those days but, you know, just something that you could actually put your finger on. And so I was diagnosed in 2000, so then I had 17 years. And the last 10 years I’ve had everything. I’m Bionic Woman I am now. Everything was done. I had my hip done and that was very successful. Went to Australia three months after my hip was done all by myself. Clint: That ends up…did they say that the foot breakage was related to your health condition or was it Drew [SP]? Sally: I didn’t know that Drew was related to my knee, they didn’t want to touch it, you know, because in case…I supposed in case I sued the guy who had done my knee, I don’t know. But I just wanted to get my foot fixed. I had it unfixed for 18 months. I was hopeless. Sally: Yeah, I had x-rayed three times and each time they said, “Oh, it’s worse than it was last time.” And I was going, “Um, can you not fix it?” And they said, “No, you’ll have to see your own GP.” And I thought, “Oh, well.” So eventually, Cat brought a walking plaster to put on because I couldn’t walk otherwise. And I got hold of my new rheumatologist up in Dublin, and went up and saw her. And she said, “I’m not gonna touch you till you’ve had your foot fixed.” And she put me in touch with this top foot guy, and he was brilliant, he was absolutely brilliant, you know. I had to have it operated on. I had to have titanium inserted into it, and he rebuilt it because it was collapsing. And then he told me that the other one was actually worse, the right one was worse. He said, “That’s going to break as well.” But he said, “You’ve got to get over the left one first.” So I had, I think, about 18 months in-between operations. And then by that time, we were in Greece. On the second day we were there, the right foot broke. Sally: I had taken nice, big glacier boots with me. So I clumped around Greece in these creepy glacier boots. Clint: Isn’t it insane how much pain we can put up with when we’re going through this disease? I mean, it’s unbelievable. Sally: It’s absolutely daft. It was daft and it was…and I’ve been two years without an operation. And I’m not gonna have any more operations. That’s it. You know, I had four months in the wheelchair. I had to be non-weightbearing. I tripped over my own feet when I did eventually stand up and broke my wrist and my shoulder. Clint: What?! Oh my God. Sally: Yes, I fell. I just fell. I went down like a tree, you know? I just fell. And I was lying on the floor and thinking, “If I had a gun, I’d shoot myself.” You know? Right? My son, who came over at 90 miles an hour, and he rang the doctor and the doctor said, “Well, stand her up and see how she is standing up.” I thought I had broken both my feet again, but because they were in boots, they didn’t break, but my shoulder broke and my wrist broke. Clint: So you’ve broken both the…you’ve had a hip replacement, you’ve had your knee arthroscopy, which was a disaster. Sally: And I had a total knee replacement afterwards. Clint: And you since had a ton… Now all of this stuff, would you say all of this stuff is related to the rheumatoid arthritis impact? Sally: I think so, yes. I think so. Definitely. Sally: You know, they had you around it and said, “Well, it could be just ordinary arthritis.” And you think, “Well, that’s funny. I didn’t hear that before,” you know? Clint: Yeah, yeah. The foot breakage, I wonder if it’s due…what medications have you been on this whole time? Sally: Mainly on Humira and Methotrexate. And here because they didn’t know about Humira, they made me come off of it for six weeks before an operation and six weeks after. So I got my RA back in that time. You suddenly realize how good it does you, you know? But yes, it was sort of difficult. And as I said, I had one operation after another. The foot surgeon told me it was definitely because of my knee. He didn’t mince words. He said, “Because your knee is put in wrongly, it’s not…it’s put in crookage, it’s not straight.” And that changed my balanced, which caused my feet to break, my foot to break. And then because my balance…and that caused the other foot to break as well. Just this tiny bit difference in balance. Yeah. Clint: Wow. Okay. Well, all right. Well, let’s talk about, you know, these things are obviously, like, horrible life events. Let’s talk about some stuff that our audience can also relate to. I’d like to talk about Humira. A lot of people would get into a position where they might be considering going on Humira. Tell us what your experience has been like on that drug? Sally: Well, I was told that I could have it for free in Ireland because Abbott Laboratories is here that makes it. And so that sounded good. As my insurance said, “I will only pay for it for three months.” So I said, “What’s the good of that?” You know? But then I discovered I could get it for free. And they sent two nurses down and I’m the sort of person…I just sort of pass out at the sight of a needle. Do you what I mean? I’m not very good with blood and needles and things. But they said to me…they came with an orange, these nurses, and said, “I will inject the orange.” So that was easy, I could do that. And then they said to me, “We’re not leaving till you’ve injected yourself.” So I thought, “I wonder how long they’ll stay? How many days?” You know? Clint: Yeah, yeah. You set up the bed for them? Sally: Yes. So I thought, “Oh, to hell with it,” and just did it. And actually, they told me to do it into my thigh, and that really…and count to 10 and hold the needle in there for a count to 10. I got to about three very quickly and pulled it out. I couldn’t, it really hurt in my thigh. And so I rang them back up and they said, “Well, try it in your stomach.” And, you know, I’m slightly less overweight than I was, but that’s easy, doesn’t hurt at all. And it was like magic juice. I mean, I went front…by that time, my fatigue was so bad, I’d have to go back to bed at 11 in the morning. I mean, I only got up at sort of 7. I was too tired to walk around or to concentrate. And I injected this stuff and they said to me, “You’ll know it in five days if it’s going to work.” And it was like magic juice. I got so much better so quickly and thought, “This is great and it’s free.” But that they wouldn’t let me off the Methotrexate. So I was still on 30 milligrams of Methotrexate then. So I joined a lot of them, like rheumatoidarthritis.net, you know, it was sort of rheumatoid programs. And then I started my blog last autumn, I think it was the end of the summer, The Galloping Grandma blog, which I’d meant to do 10 years before, but I then had much more reason to do it afterwards. So I started the blog. And just to really vent, you know, I mean, it really helped just to write it down and vent. And also, I’d had just funny things on my travels, you know, because my husband worked overseas, and so…you know, he’s now retired, but in those days he worked overseas. And in order to see him I had to go to him, they wouldn’t let him come back to me. So I was traveling all over the world, to Turkey and Tunisia. He was four years in Tunisia at the end. So I got on the plane and went down and I had some funny experiences, you know. Like a wheelchair with only three wheels in Tunis. And they just kept me backwards and ran. You know, I had all kinds of funny experiences. I thought I’d blog about this, you know. Because I found that a lot of the websites for rheumatoid arthritis, very, very desperate. I mean, the Americans are seemed to take Prednisone [SP] for everything long-term, where here you’re not allowed to take it. You can take it for a flair if that’s what it is, if you know what I mean. Sally: They’ll give it to you for a flair, but otherwise, you can’t have it. Sally: Before I started your plan, I was actually taking three painkillers a day, strong painkillers a day. And I went from three to nothing overnight. I mean, sort of overnight because I looked at your plan and read page one, and it said, “Give up milk.” So I thought, “That’s easy. I don’t drink that much milk.” I couldn’t believe how much I drank normally, milk was still in the fridge, you know? So then you said, “Give up dairy.” That was a bit harder. And my husband said, “I’m not giving up dairy. I don’t have to do two things.” But it’s easy, I sort of got used to it. And the minute I started, I felt so much better. And my fatigue has…it hasn’t gone completely. You know, by 9 in the evening I may not want to go to bed, but I’m just so much better. I just can’t believe it. Clint: What would you say to someone who made that kind of claim based on what we’ve heard from you so far? How can you give us some examples over and above what you’ve already done of how life was like before compared to after you’ve done it? Sally: I was so bad before I started the Humira. Now I hadn’t tried any other…I just had Methotrexate and a lot of other different things that he tried me on. But they said that in order to get the Humira, you had to try everything else first. Clint: Yeah, similar to Australia. Sally: And he could see that I was just going downhill rapidly. But the Humira made a difference. But I was on it…I’ve been on it 17 years. So I think I was one of the first people in Ireland to ever get it. Clint: And what about the symptoms with your rheumatoid? Were the symptoms still persistent throughout that period with the Humira? Sally: It sort of…I mean, my hands…I don’t know if you can see them, but my hands are terrible. And I blog and I type, but I touch-type, I cannot type and look at the keys. It doesn’t work. My fingers don’t do that. I just touch-type from being a secretary back in the dark ages, Dylan. So the Humira helped, but as I say, it just slowly went downhill again. Clint: Right. Mm-hmm. Okay. Well, let’s talk about better times. Let’s talk about how, you know, you’ve been able to improve now. You mentioned a lot at the start of when we started chatting that you were able to go from 30 milligram down to 15 and now you’re on 7.5 milligram of Methotrexate. 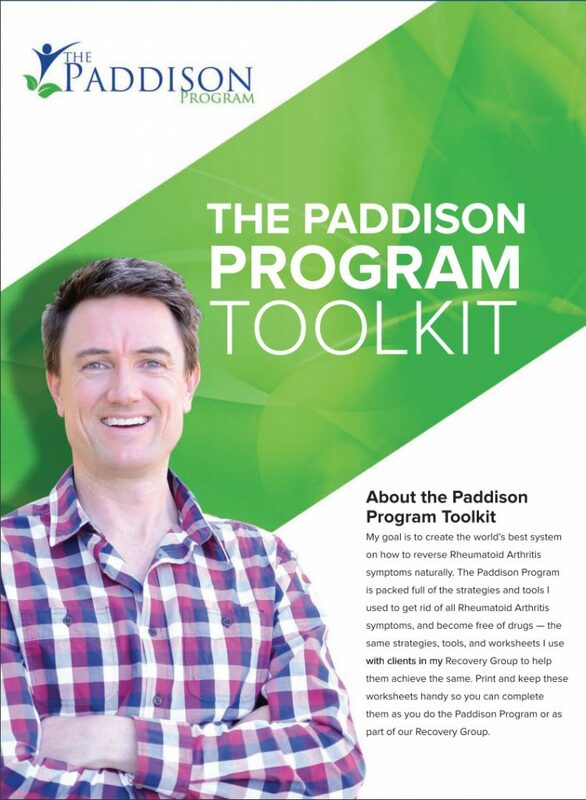 And even on that dose, you are still in a better way than what you were prior to starting Paddison Program, right? Sally: Definitely. Definitely. Well, definitely. I don’t think I actually need the Methotrexate, a tool. I mean, I don’t need any painkillers anymore and that was what was really worrying me, but…and they’d make you feel terrible if you take, really, some big painkillers. And I’d sort of had to take them if we were going to go out somewhere, you know, because I couldn’t just…I wouldn’t have been able to get through it. And I don’t have to stand up and walk around a bit. You know at dinner parties how they stand up and start walking around the table. People get really confused. But I found that my joints would sort of seize up, you know what I mean? Sally: And I had to keep moving. It was the only way I could cope with it. But I wasn’t able to…but because of my feet, I used to walk miles with a dog. And so now I can walk probably about a mile. Sally: I’m doing a sort of extra two steps every day. I get two steps further every day, you know, and that works, so. Sally: And the dog’s still barking, yeah. And my husband’s home now. He’s retired at long last. So we started this boat business now. So I’m now a person in charge of bookings, which is great. I get to talk to people and stuff, it’s nice. Clint: Yeah, well, you’re certainly good at talking so you’re in the right role in the company. Well, would you have any tips for other people who are in a bad situation and they’re on the fence whether or not they should try and make these changes that I have suggested? Sally: Well, as I say, I was the last person in the world that would have thought diet would change me at all, and to change me so quickly. I mean, you’re talking days. You know, first of all, I hadn’t got a juicer because I had given it to the kids at some point. I had to buy another one and wait for Amazon to deliver it, you know, and stuff. So then I had a juicer so that I could really start. And I love that cucumber and celery. And we’ve got a whole load of extra squashes and stuff at the moment. So I’m putting them in, too, you know, throw everything in, yeah. Sally: It’s brilliant because you don’t have to pay any money to start with. I mean, that’s what people would say, “Oh, I’m not going to pay up money for a diet.” You don’t have to pay to start with. I mean, you know, if you don’t like it and it doesn’t work for you, it’s cost you nothing. And, I mean, I bought your book because I wanted more recipes and stuff. And then I bought myself a vegan cook book. I’m not sure about that. I’m sure…because it’s not quite vegan yours, is it, it’s a little bit different. Sally: Yeah. I mean, I do the Paleo Diet as well, and just cut the cheese out…cut out the…you get such a cheese, which I love, but I just don’t…I throw in some walnuts or something instead, you know? Sally: Because Mediterranean cookery, but then it’s got oil in it. Clint: Yeah, that’s right. That’s right. Sally: You know, so it’s kinda difficult. I’m using balsamic vinegar now. Clint: Mm-hmm, good to see. You’ve been able to reintroduce some things. You mentioned that you’ve got some meat in your diet. Have you found any adverse reaction at this point by doing that? Sally: I’ve lost 21 pounds in weight. Not in money, in weight. Clint: That’s good. All right. Sally: I mean, I can’t believe it. I lost it very quickly, like in the first two weeks, about 14 pounds of it, and then it plateaued. And I thought, “That’s it. It’s not gonna work, so I must try a bit harder.” But it did. It just suddenly then started again, and so it’s going down. And for me, I’ve been stuck in a wheelchair and unable to walk for like three and a half years properly. And I used to exercise before, so you put on weight, you know, you just sort of get pear-shaped from sitting down all the time. And so that’s actually brilliant. I mean, I’m just delighted for that reason, you know, alone. I mean, it’s not really a diet and I’m not hungry. You know, to me I equate diets with being hungry, but you just substitute other things. And if you sip on juice all day long, takes your hunger away. And I just find it really works well for me and people should try it. I mean, I can’t see why it wouldn’t work for them. I’m going to do a blog on you now because I’ve talked to you, I’m going to do a blog on you next week. Clint: Yeah, great. Well, when we release this, you can share it on the blog and then your family members can hear, you know, a little bit of your story. What’s interesting when people come on and do this and then their story becomes available, you know, online, their family members watch it. And they’re like, “My gosh, Mom,” or, “My gosh…” you know, whoever it is, “I didn’t know it was that bad,” or, “I’ve never actually heard you talk about it in such detail before.” And sometimes it’s very moving and emotional, you know, for people to actually hear their loved one talk about it in more detail than they usually do. Sally: Yeah. I force them all to read my blog, but…so they know a bit about it. But, I mean, it’s difficult, you know, there’s times when you just think, “I cannot go out.” And my husband’s brilliant and he’ll go off with…and I think, “Go without me, you know, I’ll just go to bed. I just want to go to bed and just put my feet up and watch television and pester,” you know? And actually, that works quite well. But, I mean, it’s useful to have a partner who’s supportive, that I would say definitely. Sally: And he sees me going down in weight as well, which is good. He said, “When does it stop?” And I said, “Oh, don’t ask.” It really, really seemed that interesting, you know. Sally: I mean, to me it’s the best diet ever because it’s not depriving you of food, which it’s just different food. You know, if you can just get your head around that bit. And I’ve started making myself little things that I can keep in the fridge, you know. And so if I’m really, really hungry, I don’t get one. Sally: [Inaudible [00:24:28] called bliss balls. Troubling. Sally: If you need to nibble at something. Clint: I mean, how often were you getting out of your wheelchair and walking before? Sally: When I was…for the second foot, I was four months with no weightbearing at all. So I wasn’t allowed. I had to somehow get out from the wheelchair into the bed without putting my feet on the floor. And I couldn’t put any weight on my feet at all on the right foot. The left foot was a shorter time, it was about a month and then I was put into the walking boots, which I fell over and broke the rest of me. It’s stupid, you know? Clint: You certainly have been through a lot. Well, why don’t we just finish by you giving a say…have you got any fun stories? I liked that one that you were telling me about, the three-wheel wheelchair. You know, I’ve put you on the spot a little bit, but does any funny story come to mind that you’d like to share with our listeners about problems that we have when we have, you know, this disease and problems associated with it? Sally: I was reading…because I traveled a lot. Because when I was home on my own I could do things at my own pace, but the minute I had to go down to Chinoze [SP], or to Turkey, or to somewhere else, I had to sort of get into fast gear. And that’s just so funny. I mean, they try to be helpful, but the airline people are wonderful. It’s when you get off the plane and they make you wait till last and you get out. And I’ve just had such funny things with… I’d be talking and I’d set off all the alarms. Everywhere I go, because I’ve got such titanium in me, everything sort of goes. So I sort of say, “Hello, it’s me, it’s metal.” And then they sort of practically strip-search you, except in Amsterdam where they’ve got the full-body scan now and you can actually walk through it, they can see what you’ve got, and you can walk out. But otherwise… And so they said, “Take off your shoes.” And I said, “Well, I have to have a chair to sit down on because I can’t reach my shoes.” And they don’t have chairs. And I’m the granny, you know, terrorist, I suppose, because they take me apart every time I travel. In Tunisia, they made me go through the screening before I got on the plane. I mean, they put me through…cut me off the plane one and going onto it. [Inaudible [00:27:20], “I’m still ringing your bells.” But yeah. So I just found traveling… Once I got used to it and I’d get a wheelchair and just take it to the draw of the plane. And people are really helpful with that, especially [inaudible [00:27:37], you know, if you give them a…you tell them what’s wrong with you because I look all right and then I get in a wheelchair and they think, “Huh. There’s nothing wrong with her.” [Inaudible [00:27:47]. Sally: I just ask people. I asked the man next to me, I said, “Could you put my luggage up for me?” And they don’t dare say no, you know, because… But, I mean, I can remember one time at Frankfurt Airport, I mean, back home. And I had booked a wheelchair and I went to the Ryanair desk, and she said, “Oh, well, I’ll go and get it for you. Would you [inaudible [00:28:55] checking?” So she went off and there was a whole queue of people behind me. And then she came back with a wheelchair folded up. She said, “You have to push it yourself.” I said, “How can I get in the wheelchair? Would you mind just helping me?” I just wheeled it through the check-in, and then I got into the place where you wait for the plane. And so I opened it up and sat in it because it was very full and all the people were waiting to get on the plane. Clint: Yeah, that’s the bad side of traveling, isn’t it? Sally: Yeah. Usually, there are people who are brilliant, you know? Sally: And help. And if you just ask. Sally: You know, I think it’s not if you stay quiet, just ask. Clint: Yeah, I think that’s really valuable, is, anyone who’s got any kind of, you know, challenge with their physical abilities and has to do travel like this, you can always ask for help. Most people, mostly around the world, I’ve traveled a lot, too, I found everyone’s generally friendly. Everyone generally wants to help and yeah, just ask. Sally: I always pre-book a wheelchair, you know, with the airline. You know, they ask you various questions, “Can you walk out to the plane? Can you climb up the steps?” And, you know, but if I’m slow, I’m slow, but I can do it. You know, I have to get one step at a time. I’m never the [inaudible [00:31:07] because I’m getting…I’m gonna be 71 in a month’s time. And I’m never sure if it’s because I’m 71 or if it’s the RA now because I feel so good. Sally: So if I’m tired, I think, “Maybe that’s what I should feel like at 71,” you know? But I think I feel nice. Clint: So tell us where can people go to follow your blog? Sally: On WordPress. It’s called the gallopinggran…if you just put in thegallopinggrandma.com, it’s all one word, thegallopinggrandma.com. Sally: That puts you into the blog. Clint: All right. Awesome. Well, we might direct people to there so they can not only, you know, find this episode as well as find it on YouTube and on our particular blog. Sally: Yeah. It started as a terrible blog, yeah. Clint: Awesome. Awesome. All right. Well, I think we’ve certainly had a lot of your, you know, heard about a lot of your challenges and a lot of your ups and downs. And you’ve certainly been through a lot and I think it’s just fabulous, your sense of humor and the way that you’ve been able to sort of, you know, be a little bit aloof, like this whole thing…. Sally: Well, I can’t thank you enough. Clint: Yeah, I just wanna laugh at the whole situation. Sally: Yeah. You have to. And also, I just feel so much better and I can’t thank you enough for that. I mean, I’m just like I’m reborn. It’s amazing, the difference, really. Even my husband noticed the difference. He says it’s like having a new wife. I’m not so sure about that. Sally: Well, well done is all I can say. Well done. I mean, brilliant. Sally: You deserve all the praise you get, you know? Clint: Oh, thanks very much. Hopefully, more people can feel inspired by listening to us chat and go out and make some positive changes. And as you say, all you need to do is, you know, get the free information on our website, watch these YouTube videos. And there’s so much you can do straight off the bat. And it really is a case of taking action and applying discipline. And if we do those two things, we’ll get tremendous results. Sally: Yeah, and it’s not that difficult. It’s not that difficult, really. I mean, if I can do it, anybody can do it, I think. Clint: I always get a buzz when the doctor is blown away by results. That’s always a huge buzz of mine. Sally: Yeah, seriously. Yes, she said she’s going to watch your Ted Talk and research you a bit, so there you go. Clint: Oh, that’s good. That’s good. Well, Sally, thank you so much for coming on this episode, and thanks for chatting with me. And I look forward to staying in touch online.